Sri Yantra - Occult Speak Sri Yantra is said to be power house of wealth and fame and has been used since ages across globe by all civilization and it is also most secretive yantra of india. Once upon a time Wealth demigod – Laxmi get anger on humans on planet earth and left the planet and went to Vaikunth Dham, due to this on entire planet goes into big depression and people went in heavy losses as wealth has been deprived by its demigod, Brahmin, Tradesmen etc felt stick and people went to Shri Vashisht Muni to find the solution to bring back Laxmi to earth. On request of all humans, Shri Vaisthistji went to the home of Laxmi- Vaikunth Dham and request her to come back to Earth but Laxmi was very much firm on her decision and refused to come back, on this Vaishisth rishi start the devotion of her husband Vishnu Bhagwan. When Lord Vishnu appeared and ask the reason for this devotion, Vaishisth request him to take Laxmi to planet earth, hence on request of Vaishisth, Vishnu went to Vaikuntha and request Laxmi to go to Prithivi Loka but again Laxmi refused. This time Vaishisth went to his people and share all the incident, then all the people along with the Vaishist went to Guru of demigods – Devguru Brihaspati, Guru told Vaishith to create special metal made Sri Yantra and infuse the energy with Veda mantras, then only Laxmi will come back. It is my soul – hence I have to come wherever there is Sri Yantra. 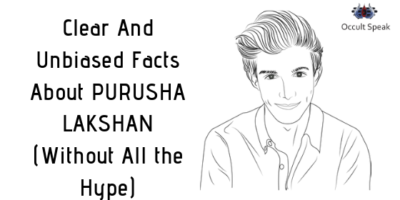 The above story is very famous in many scripts of Hindus hence we can understand the importance of Sri Yantra, wherever there is Sri Yantra, Laxmi will come to that premises. This yantra has immense power and it hides many secrets, the scared geometry of this beautiful yantra is still unknown to many of us. Not only in India but also in the whole world, people are still trying to research and find the history and secrets behind this yantra. It is been said and heard that Lord Tirupati Balaji Temple at Andra Pradesh is the wealthiest temple in the whole world that is because, ( before building the temple), priest of those days has kept Energize Sri Yantra in the foundation of the temple, hence we can see the result till date. It is said that there are 64 types of Sri Yantra kept in foundation of temple. To understand the coding of this yantra is extremely difficult just like of Sri Sukhtam which contain 16 slokas , Brahmin today used to recite this slokas at Deewali but hardly get any results because according to Tantra Scripture – Mantra Mahawarna : “Sri Suktam is method of conversion of any metal into pure gold, whenever there is complete coding of this language is understandable, I bet that person will be Wealthiest Man in the whole Universe”, the complete understanding to this yantra can be only done by understanding /decoding the 16 slokas of Sri Yantra. Great Rishi Karnaad once said: If this Yantra is highly energized then there is no way that person bad fortune will come to an end and will convert man ill fortune into wealth. Sri Yantra creation is of utmost importance, the 7 triangles in yantra with Bindu – dot in the centre along that extra 10 angle with more 5 angles formation created Beautiful mysterious Yantra. Below this 3 energy lies 16 triangle formation after that lies 8 triangles which depict Asthalaxmi – 8 different form of Mahalaxmi. Beneath the 8 triangles it has 14 small triangle depicts its 14 superficial energies centers, further, it has 10 more triangles under 14 energies center, this 10 minutes triangles are 10 best wealth of this universe which is termed as “Sampada” in Sanskrit. After this 10 samapda – in triangles lies 8 small triangles which are again depicted 8 feminine energies/ Ashta Durga Swaroop.Next, to Astha Swaroop lies small single TRIANGLE which is depicted Goddess Mahalaxmi and last in inside the triangle is dot – Bindu which is said to be the manifestation of Adi Shakti Kali which is the main source of energy to this Universe. 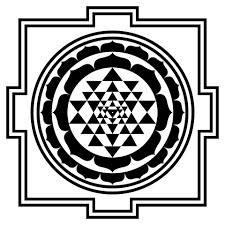 In a way this yantra has 2816 energies centers /shakti of Parvati, hence by doing the ritual of three yantra one activates this 2816 energy centers of the universe. There are many books written on Sri Yantra but none of them are able to codify the methods to activate this centers of energies. Not only in India but also in European counties Scientists are engrossed in finding the secrets of Sri Yantra. 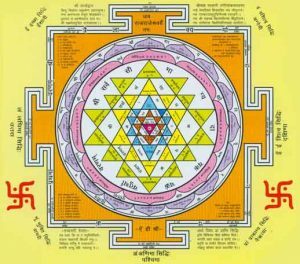 More you try to understand this yantra more one get confused to the creation and functionality of this yantra. I would say Sri Yantra is one of the best creation of Indian Civilization. Since the experienced scholar can give more insight to this wonderful Sri Yantra but I will give basic information to Poojan of this yantra. Take a bath and sat down on the yoga mat or cotton asana facing East direction. In front place wooden plank and place yellow asana for Laxmi and Sri Yantra, place Sri Yantra, Laxmi idol/pic, and Ganesha. Wash the yantra with pancha-amrut ( cow ghee, cow milk, sugar, honey, and curd ), then with Gangajal – holy water and then with plain water. Offer saffron/Kesar – Kumkum, rice, ghee lamp, yellow flowers,agarbatii & yellow fruit/sweet dishes or yellow colored food to Shree Yantra and another idol on the wooden plank. Take kamalgatta rosary to chant the mantra. 1 round contains 108 times repetition of the mantra. There are many ritual on sri yantra and other allied therapies , will post such articles , stay tuned to occultspeak. Sri Yantra is said to be power house of wealth and fame and has been used since ages across globe by all civilization and it is also most secretive yantra of india.